Hey guys I have just got to share this someone!!! 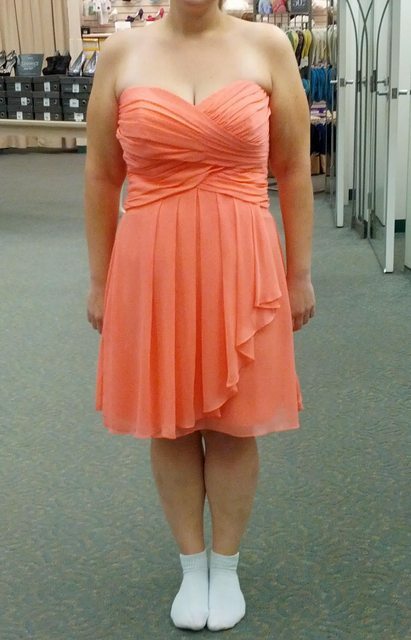 I went to David's Bridal today to order a bridesmaid dress for my friend's wedding. I was expecting to order a 14. I tried it on and it was too big! The 12 fit! Then I made them take my measurements just in case and I am totally a 12! At age 16, I wore a David's Bridal bridesmaid dress to Prom. It was a size 16. Today, at age 29, I am a David's Bridal 12. I can barely believe it!!! Congrats!!! I'm sure you'll be a gorgeous bridesmaid, have fun! That's wonderful...you should be very proud of your hard work. Enjoy the wedding! Congratulations! You'll have to post of a pic of you in the dress! Congratulations! I know you must feel good. You're where I want to be... ONE DAY! Dreams can come true! You're living proof! Way to go! Here is a pic of the dress, but we ordered it in the color wysteria. It's like a medium purple. Last edited by Underwater; 05-16-2013 at 03:28 AM. That is awesome and it is a beautiful dress! If that is you wearing it, you look fantastic! That is fantastic! You look great in the dress. That looks fabulous!! You should be insanely proud of yourself...congratulations! !